We are very proud that one of our logos has made it into the National Museum of Ireland as one of Ireland’s Top 100 Objects of all time. It’s a bit embarrassing now but at the time it was a major coup for an Irish Agency to deliver a full corporate identity roll out for an Irish Bank in a pitch against a raft of international brand agencies. 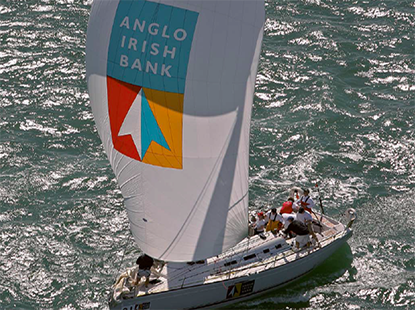 The design drew on iconic objects of Ireland’s past: “Based on early Irish references such as flint arrowheads, typography from the Book of Kells and crafted gold artefacts, the simplicity of the image sets the tone for a more cohesive corporate identity programme and spearheads measurable improvement in brand awareness.” By the time the sign was taken down, Anglo Irish had certainly achieved a very high level of brand awareness: it had become one of the most notorious banks in world history. The innovative design was to be a true merger of past and future, of security and progression. Joe Gervin, the lead designer on the project is still with us and is still quietly proud of the design. Some of Joe’s other notable Irish brand creations for us include VHI, Siucra, Irish Pride, Ballymaloe, Irish Greyhound Board, DIT but love it or hate it he’ll always be remembered for this one! We subsequently won a competitive pitch to design the IBRC identity to replace the iconic brand but unfortunately, the lofty budgets were well gone at that point!